Welcome to SalesHood’s August release! We are pleased to introduce the Google Drive integration, Prerequisite programs for Learning Paths, and much more! Please email us at support@saleshood.com with any questions. We expanded our Content Management Library even further by adding Google Drive integration. Now you can easily import, file, tag and view files or folders from Google Drive in your SalesHood library. Do you have programs that are required before others? Or do you want to prevent people from jumping around the set path? Now you can make any program within a Learning Path a prerequisite to any other program(s). To set prerequisite programs for a Learning Path, you need to be either a coach or the host of that path. If you are, then after adding all your programs to a path, on the schedule page, hover over a program and select the ellipses. After selecting the ellipses, choose “Edit” and a pop-up will appear with the option for prerequisite. In this pop-up you can now see all programs in order from beginning to end separated by your sections of the path. If the program’s prerequisites are the entire path or an entire section, simply select the checkbox on the section title or “Select All”. If the program’s prerequisites are particular, simply individually select from any section which programs are required to complete. The pop-up prevents anyone without completing the prerequisites from viewing any part of that program. In the pop-up it displays all required programs with links to each one and the path they live in for the person to complete. Once all the prerequisite programs are complete, then this pop-up will no longer appear. Note: A program can have an infinite amount of prerequisites. 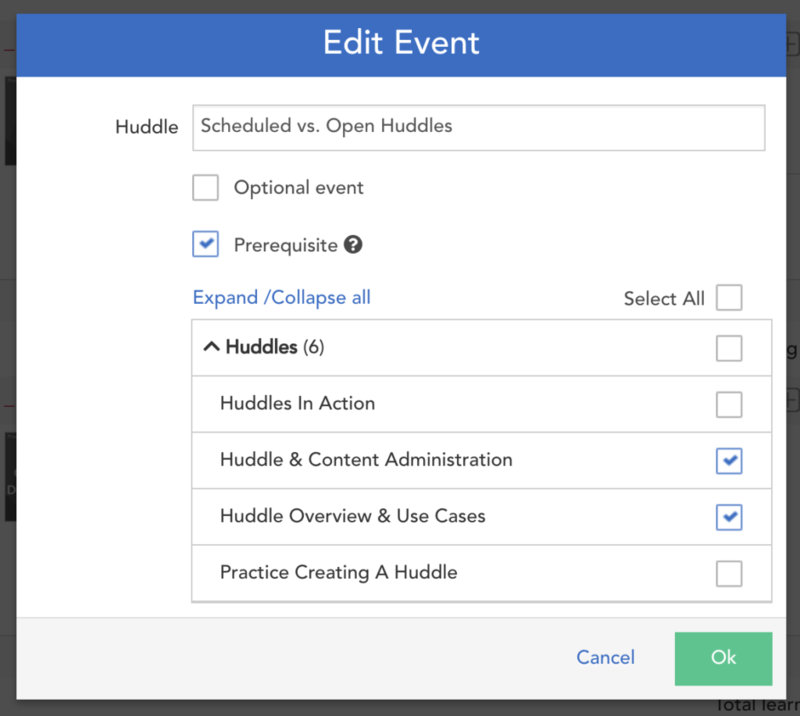 Want to mention someone in your company about this pitch, module, file, or huddle? We have updated our @mentioning so you can now mention almost anywhere there is a field in SalesHood. Give it a try by going to a field in a pitch and type “@” then the name of the person. After submitting your response, the @mention person will receive an email directly to where you submitted. There are no limits to the number of @mentions per field so mention away! 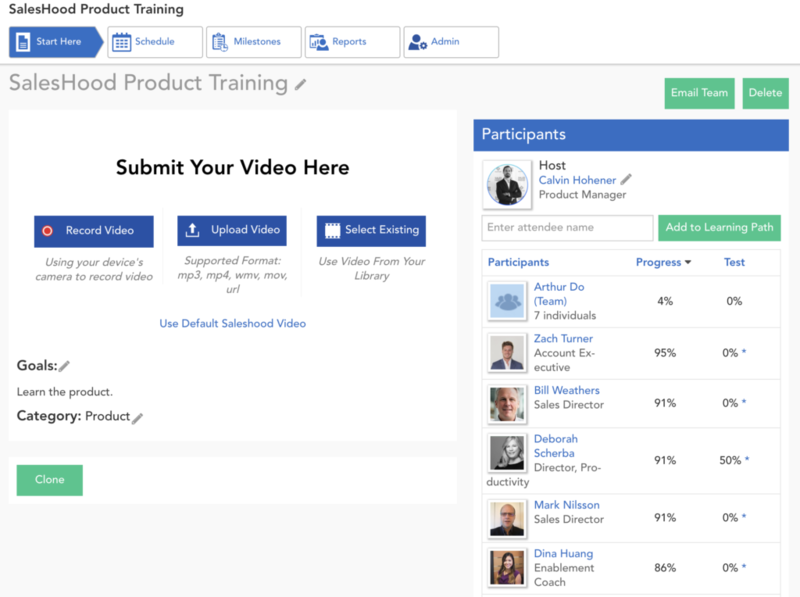 Publishing a more engaging Learning Path just got easier with the ability to record, upload, and select an existing video for the “Start Here” page of every Learning Path. Second, select the option you want, record, upload, or select existing. Third, submit your video and it is now available for all participants. Watched a video last week or month and don’t remember? We are now adding a “Done” banner to completed videos, Stories, and Deal Wins in the Library to make it easier to know your progress. The banner and progress appear for both thumbnail and list views in the library. To switch to another SalesHood account, select the gear icon on the top right of the “Notifications” tab then select your account on your mobile device. Have any questions, suggestions or feedback? Email us at support@saleshood.com. Thank you!